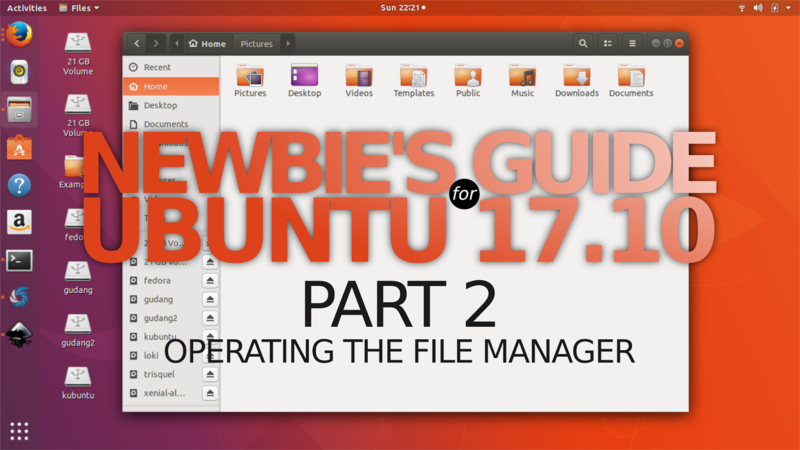 This is Part 2 of the newbie's guide to operate Ubuntu 17.10. 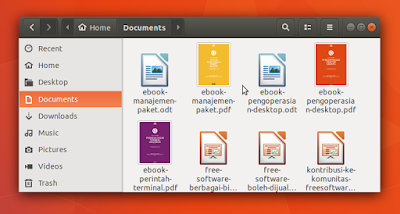 Here you'll learn how to operate the Nautilus File Manager. 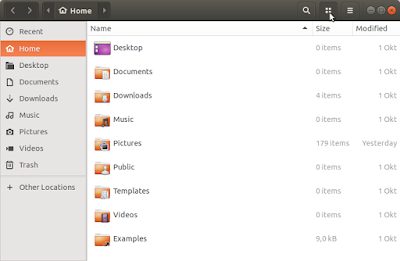 You'll do most of daily activities in Nautilus because it is your file manager, like Finder in Mac OS X or Explorer in Windows. You'll learn basic skills such as selecting & navigating, creating & deleting, searching & sorting files/folders, and also basic knowledge for keyboard shortcuts and the user interface. I wish this article helps you best to run Ubuntu 17.10 easily and happily. Enjoy! This is Part 2 of Ubuntu 17.10 tutorial series. Read the Part 1 here. If you're looking to reviews, read our series (Ubuntu Part 1 until Part 7, Kubuntu, and Artful MATE). Clik the "cabinet" icon (tooltip: "Files") on the vertical panel. 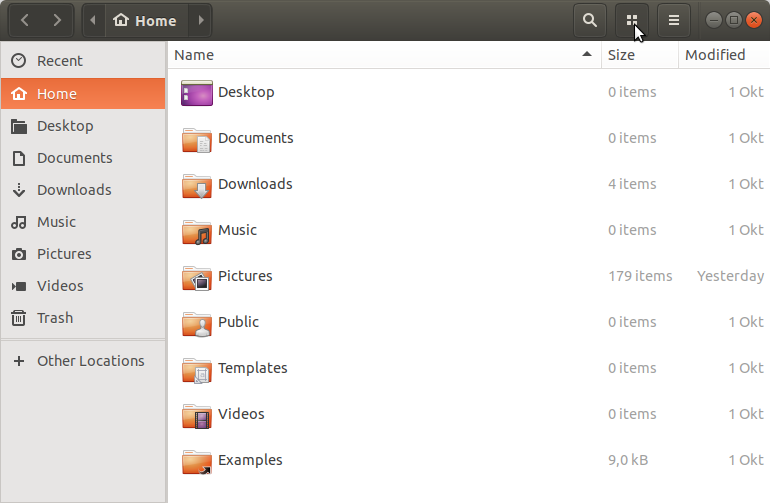 Or, open the Ubuntu Desktop Menu (press Super key) and type "nautilus" then click the "cabinet" ("Files") icon. Or, if you find any other way failed, open the Terminal and type nautilus and press Enter key. 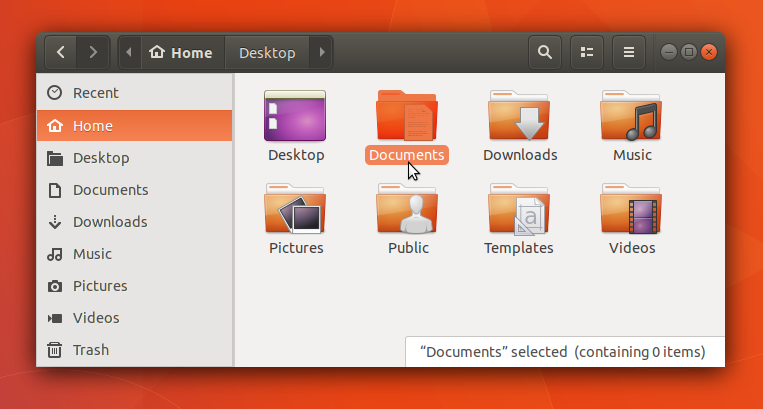 Note: the old name "Nautilus" is now replaced with the new name "GNOME Files" (or simply "Files"). 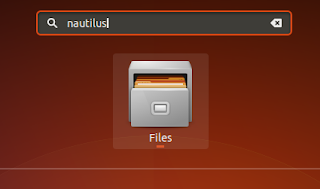 On Ubuntu Desktop, you will find the name is Files and not Nautilus, but the command line is still nautilus. Here I keep this Nautilus old naming because it's more consistent and easier to write. 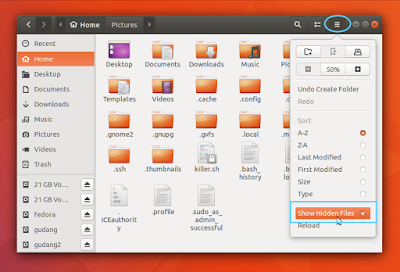 Surprisingly most keyboard shortcuts of Nautilus are same with Windows Explorer's and many other file managers. The appearance of Nautilus is surprising for newcomers (but won't for Mac OS X users) with very simplistic design. It has no menu bar, it has no tool bar either, and also it has no status bar. Then what remains? 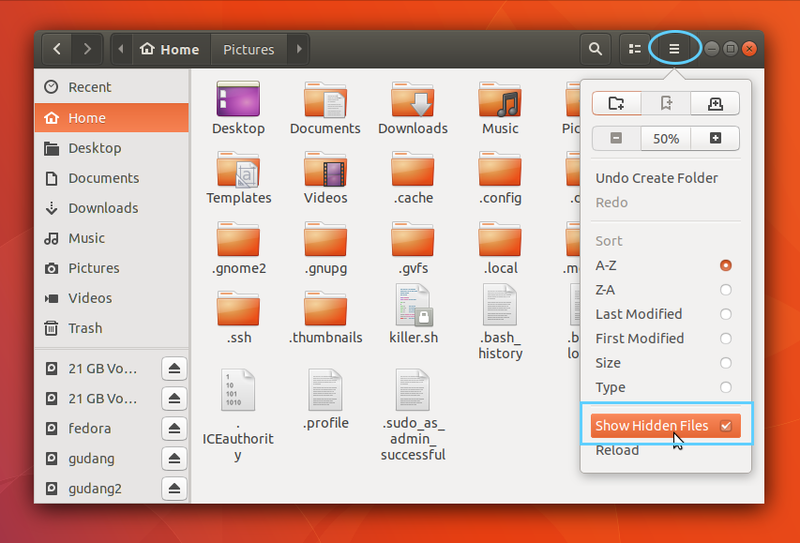 You got only one menu at GNOME desktop's top panel (global menu), you got few buttons to handle many tasks at black top bar, and you got extra large space for main area and left sidebar. 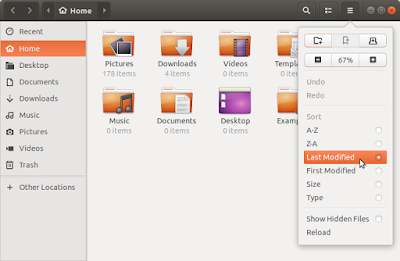 Menu is only one ("Files") and is located at top bar. See this picture. I won't explain all buttons and features one-by-one because that would be ineffective. I suggest you to recognize them by trying yourself. Basic skills in using a file manager such as selecting & opening, creating folder & deleting files, searching & sorting, are discussed here. 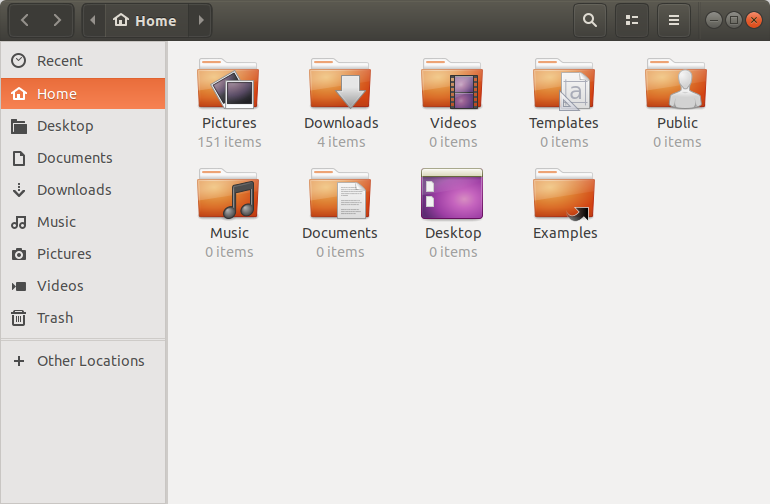 This including how to access system folders as administrator. A single left-click to select, double-click to open. You're familiar with these if you come from MS Windows. 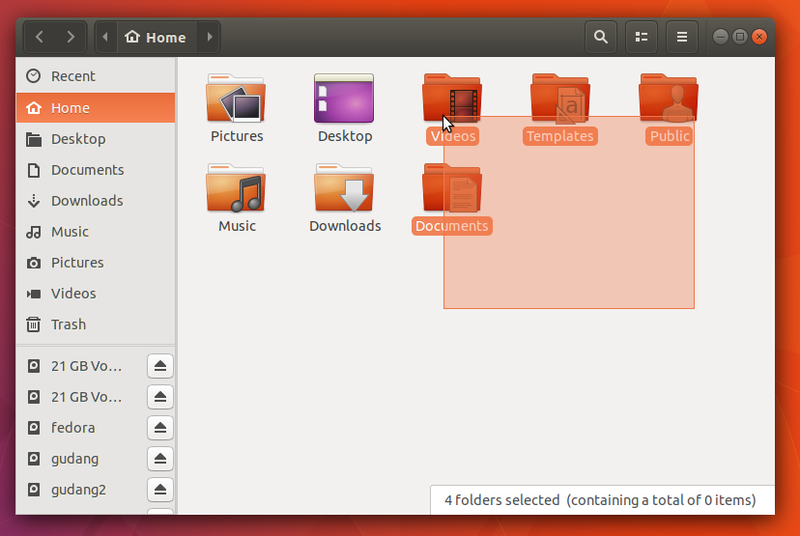 Drag your pointer on main area > this creates an orange rectangle of selection > hold-drag it until all files/folders selected. Or, you can select one file/folder first, then hold Shift key, and press Arrow keys to choose other files/folders. See picture below, focus at the keyboard indicator (Shift+Right). Or, you can select multiple files/folders by choosing one-by-one: hold Ctrl key > click a file/folder, click another files/folders. 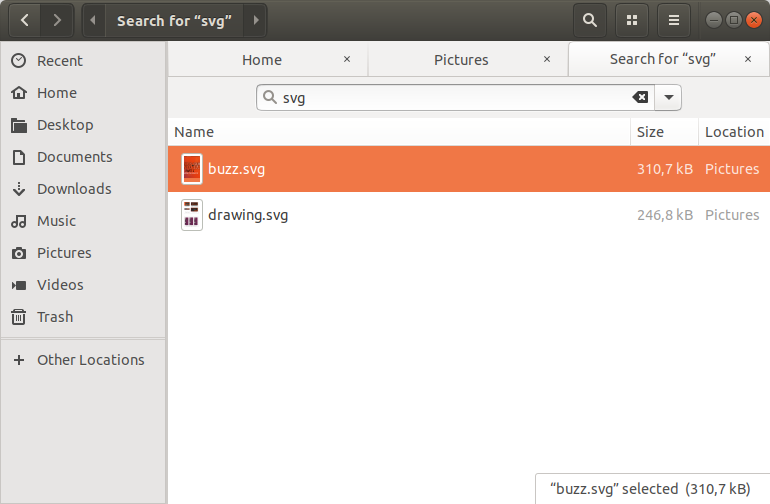 This way of selecting is best to select only particular files. See picture below, focus at keyboard indicator (Ctrl+Left_Click). Press Ctrl+L to show the address bar > type a path (e.g. /usr/share/doc) > press Enter. Right-click on empty area > New Folder > type a name > press Enter. Or, just press Ctrl+Shift+N. Permanently: select file > press Shift+Del. Non-permanently to Trash: select file > right-click > Move to Trash. 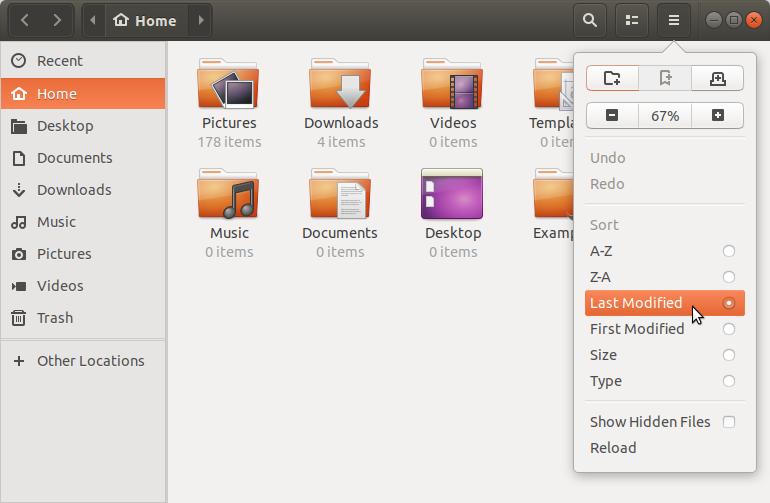 To restore deleted file, go to Trash icon (left panel) > select the file > press Restore button. Plug any USB drive in > it will appear as ["Disk Name" "Eject Button"] on left panel. This way you can access your USB flash drives, SD Cards, or external HDDs. To unplug your drive safely, press the eject button (reversed black triangle). 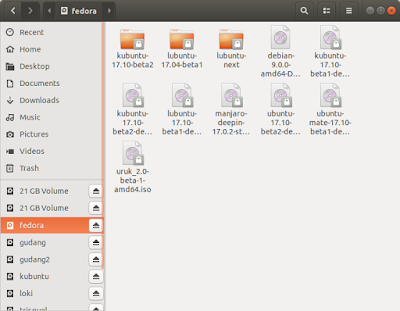 Go to "Other Locations" > now you see at main area all partitions from your internal hard disk. 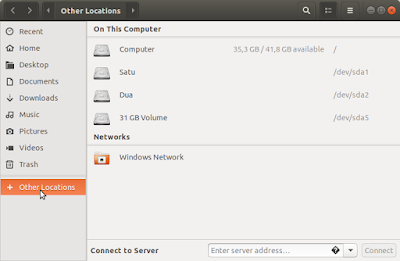 This way you can access Windows partitions (if any) or your data-storage partitions. To unplug your partition safely, press the eject button (reversed black triangle). To access system folders: go to / . 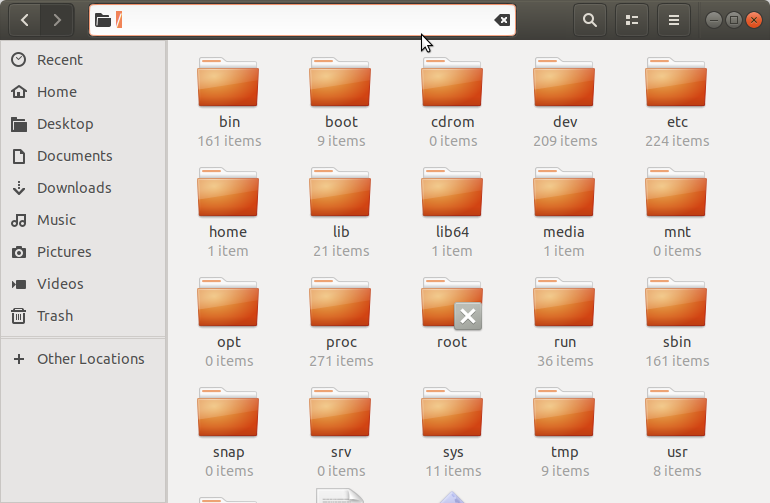 Here you should see /bin , /boot , /etc , /home , and other system folders. 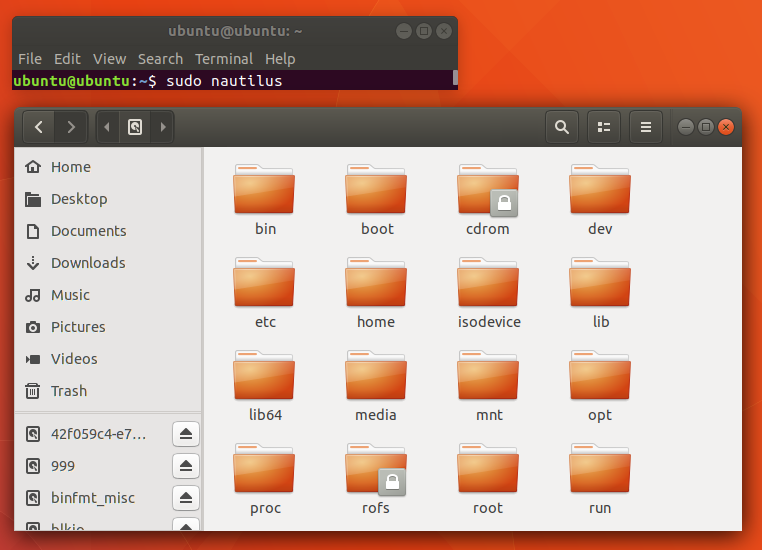 To access system folders as root (administrator mode): open your Terminal > enter command line sudo nautilus > enter your password > Nautilus window opened > go to / > now do what you need > don't forget to close Nautilus. Newest first: choose Last Modified. Latest first: choose First Modified. For daily use, it's good to use Last Modified so you always see the newest files on top. 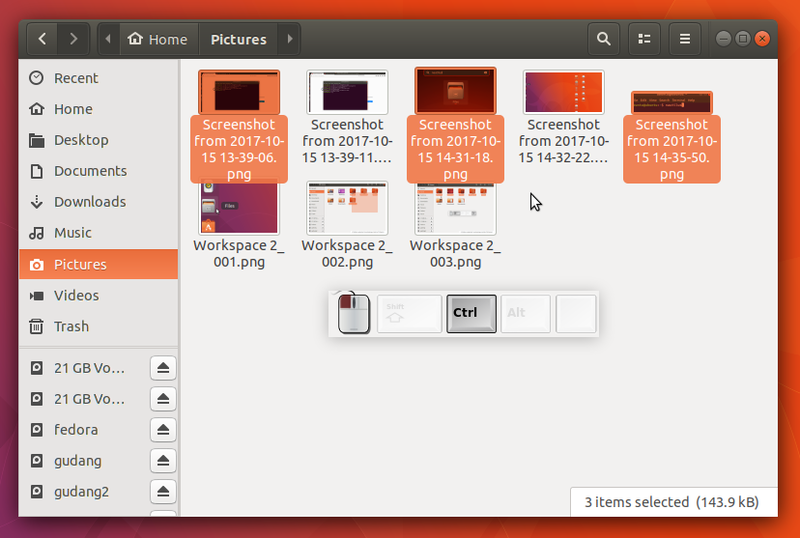 Nautilus provides 2 kind of view you can switch by the View button (between magnifier and triple-lines buttons). Press Sorting button > check Show Hidden Files. Do it again to Hide them. You can do that quicker by pressing Ctrl+H. 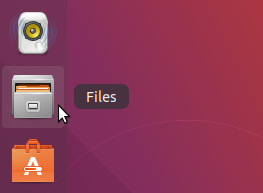 The hidden files are files/folders with a period ( . ) in each of their name. 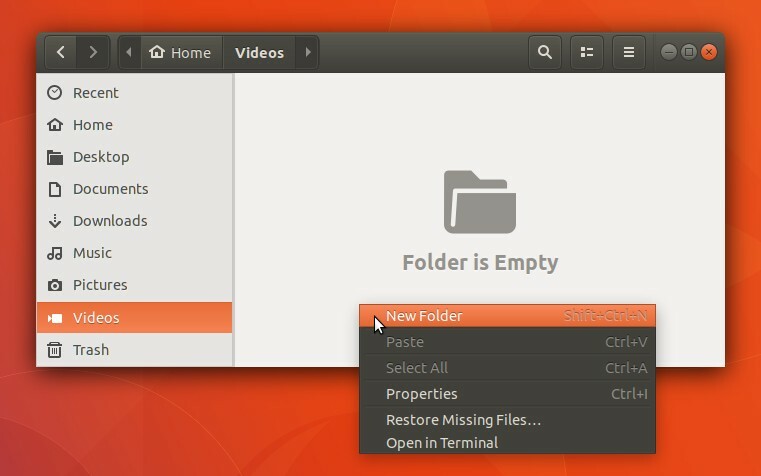 It helps many newbies while Nautilus can open current folder in a Terminal. This means you don't need to change directory in Terminal. This helps a lot when you want to follow a tutorial article by yourself. Right-click at empty space > Open in Terminal > a Terminal window appears. 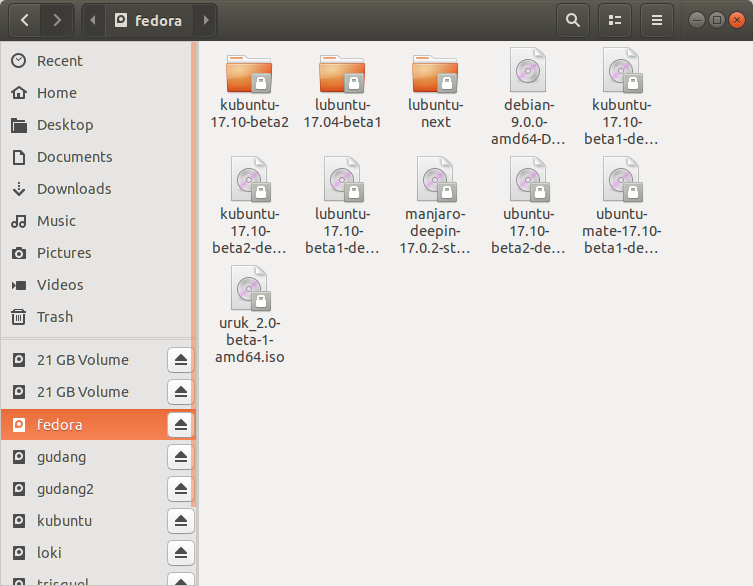 Check the paths in Nautilus and in Terminal are same (e.g. 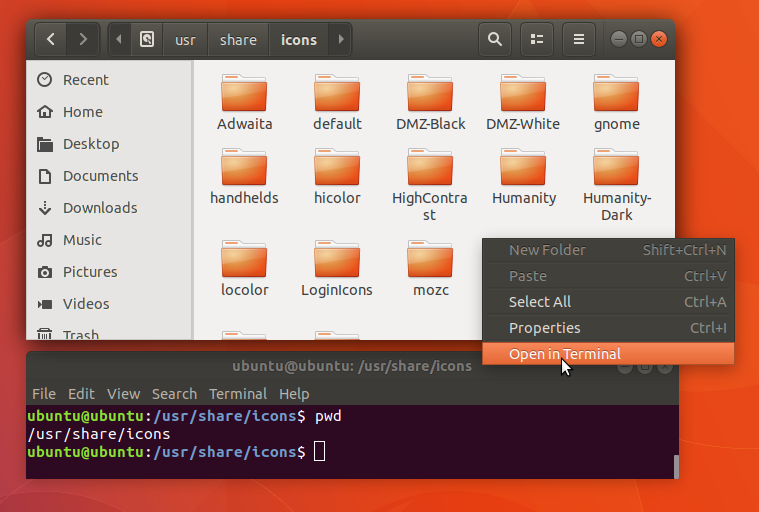 /usr/share/icons/).